DYS F4 PRO V2 flight control with high performance which is designed for FPV hobbyists. Not only combine PDB board together with flight control, but also integrated OSD, current meter, voltmeter and built-in high power BEC etc functions. DYS F4 PRO V2 flight control can meet all the functions you need include FPV racer, aerobatic flight and aerial photograph. 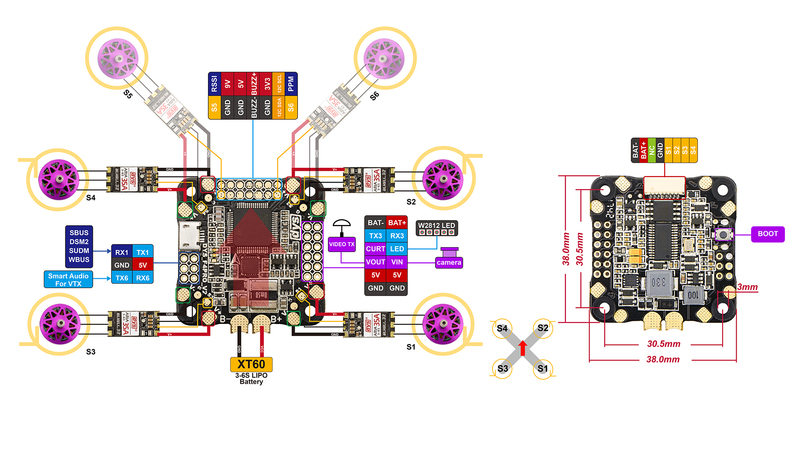 - When use with 4-in-1 esc, plug in the battery to supply the flight control instead of BEC.